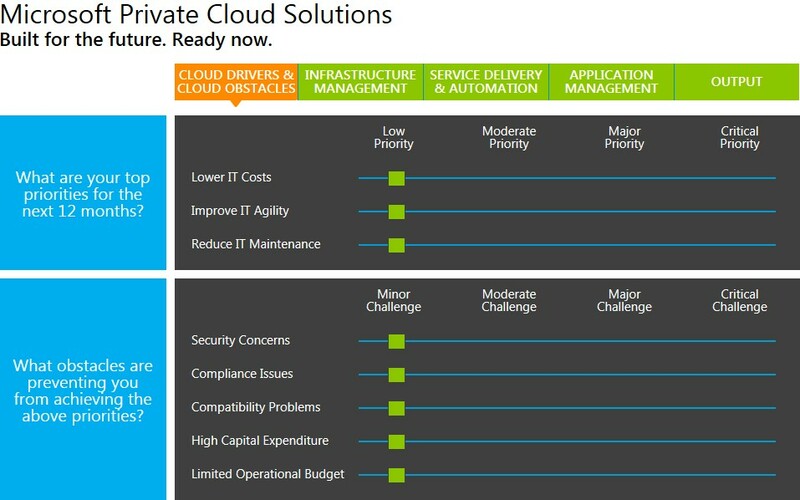 If you are just making a move to virtualizing your infrastructure or new to virtualization technologies, you might want to give Microsoft Assesment Tool for Private Cloud a try. 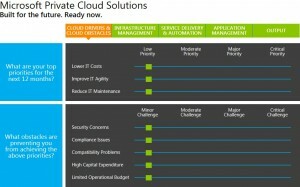 The assesment tool for private cloud asks you a few questions about your current IT infrastructure, virtulization capabilties in place already, service level agreements if any etc.. Once the tool completes its assessment, it provides you with a comparison of your business as compared to other industry peers with cloud virtualization in place. It also makes suggestions for various areas that you can improve in costs, delivery and quality to your end users and for your organization. It gives you easy to understand tools and reports which will help you understand how to develop an on-premise private cloud to deliver the benefits of cloud within your current security and virtualization infrastructure framework. You can even download your customized report (I strongly recommend you do this), the site results report any discovered improvement opportunities for your current IT infrastructure. Through the Private Cloud Assessment website, you can connect with Microsoft Certified Partners for help and even conduct a free partner led free comprehensive assessment of your virtualization infrastructure. You can get to Microsoft’s Cloud Assessment tool online by going to the cloud assessment tool website.